One image sums up my time in the Omo Valley: the remote area in south-west Ethiopia where tribal cultures still flourish. I’m attending a wedding in a village several miles down a dusty path, barely usable by vehicles. The woman in front of me has the braided, red-dyed hair typical for women of the Hammar tribe, and the usual animal-skin skirt with yellow beading. I’m also impressed by the leather sling in which the naked baby seems relaxed. 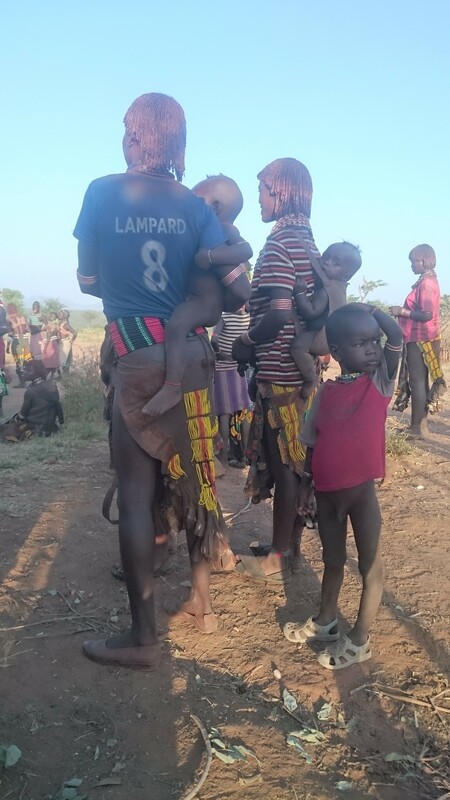 Just one anomaly: I’m looking at Lampard: 8, on the back of the Chelsea football shirt she’s wearing. Guide books will tell you that the Omo Valley tribes are a tourist highlight of Ethiopia. When I was asked to run some training for a pioneering UK Charity, Farm Africa, in nearby Jinka, I scheduled a weekend trip to Omo. I had great difficulty imagining it, and now I see why. This is such a different experience, it’s hard to take in, hard to describe, and hard to understand. Suddenly I’m in a coherent tribal society. It’s so visually different, it’s easy to get stuck at that level: with hairstyles, body painting, clothes and ornaments I’ve never seen before. Even with a ‘local’ guide, its hard to get beyond this to a sense of what tribal life is like, and why it has survived among tens of thousands of people in this area, but largely disappeared elsewhere. I realise it’s horribly easy to project onto this situation. Everyone I see today looks happy and healthy, but how can I know? I do get the sense, as in tribal communities I’ve known elsewhere, that collective identities are more important than the individual or nuclear family. When we arrived, all the older men were together in the shade: they welcomed me as a fellow-elder, and shared their home-brewed drink borde, with me: it’s made from sorghum and millet and tastes indescribable. The sharing works both ways – when I started nibbling a cereal bar, they wanted to try it. Mainstream Ethiopia is already a world away from Western Europe, especially in the country. In these villages, both these worlds converge with the tribal one. At its worst, tribal culture becomes a mere income source from gaggles of tourists with cameras. I made some effort to avoid these places, and it was blessedly clear that the Hammar wedding was simply that: the dance and ritual were done for their own sake, and there was friendly tolerance for a few tourists watching. But it’s still strange to see white folk plus their big white 4×4’s, and their entourage of drivers and guides, in a village like this. Of my three tribal encounters, two were delightful, but the village of Kolcho, where the Karo tribe lives, was a low point. My guide book had warned of a caravan of 4WD’s: in fact, most of the village were constantly pestering visitors to take their picture for money. This included children, women and old men, offering some combination of body and face painting, exotic hair styles, guns, bare breasts, and flour grinding. It was clear that everything here was put on for tourists, and it all felt rather sad. I’m left uplifted and enriched overall by my Omo Valley visit – but also wishing I could see into it more deeply. The ‘wild margins’ idea in my ecosystems model suggests that new mainstream solutions often come from a periphery that looks different and irrelevant: which may be why my curiosity has a point.